So now you all know why I chose to compare those 3 decks and no others. So you're out of the water and are feeling comfy on that concave top. You edge out and that's where the rocker and edges come in. On that part you just can't do any better than the Integrity or the Omen: they both have re-shapeable rails so you can make it ride just like you want it, sharp and snappy or rounded and more mellow--it's up to you! The Bi Level is your regular wood concave on the water while edging. Nothing too special, besides the fact that you feel much higher on the water (more like a skate there). That is again, a love or hate thing. With wake to wake riding, I think it is way more of a rider thing than the board. All three are really good for that. The Bi weight is actually very good for wake to wake stuff. The Integrity really stays close to the feet, and well the Omen, you just have to see how huge Pete and Drew go on it to know it's got what it takes for going wake to wake! 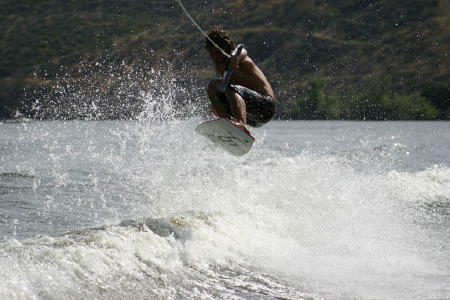 Omen rider Pete Ward going wake to wake without bindings. For all the lip and tech stuff like shuvs and flips, I think I like the Bi level and the Omen just the same. In my opinion, that has to be because they are wood decks; I just love the feel of wood on the water. The Bi is a trick machine but there is a BIG problem with it, and I'll come to that later. The Integrity can be popped damn high like Chris Barcellos does on that shot. I really LOVED how my Omen spun on shuv tricks. I think having Justin Scott on the team while designing the Revolt made it into a mean lip/tech tricks machine. And this is where something lies that I only saw on the Omen. After my second run on it I moved my feet back some more up the kick tail and I got the biggest push from a deck I ever got, even more than the Bi! I was pretty stoked on that massive ollie! And with the ollie motion the back foot stays where it's at so it didn't feel at all like I could split from having my foot back too much. Chris Barcellos, all high on pop rocks, Coca Cola, and massive re-entry shuvs. So here are my final thoughts on those three decks. The Bi Level is probably by far the most innovative concept out there and it works damn well... for five rides. So If I could ride a brand new Bi Level every four runs or so it would be the best board out there... it just doesn't keep its pop and will break in two in no time. I know Thomas changed a lot of stuff for 06 and they should be more durable, but it still is a plain wooden deck and WILL break/delam/take water fast! When I was in LA last weekend we did a crazy winch session where you would land on concrete in four inches of water. Needless to say, the only boards that held up were the Integrity and the Omen. So just for that fact, the Bi Level can't be the best skate out there, even though it can ride like it! I know you probably want a definite answer between the last two decks, but I'm sorry, you wont get one :) They are too different to say that one has to be better than the other. If you like the wood feel on the water then the Omen is probably more suited to your style. For me, the board weight is important, and the Omen, being between the Cassette and the Integrity, is just perfect for my tastes! Heck, mine is even heavier than what production boards will be! Justin Scott, bustin' it...sorry about that.